Ever since Ubisoft turned Assassin’s Creed into an annual franchise, each installment has felt more like a sizable DLC than a true sequel to the story. Being somewhat underwhelmed with Brotherhood and Revelations on top of hearing complaints from others about Assassin’s Creed 3, I had low expectations for this next installment. After playing the game for myself, it did not take long to put my skepticism to rest. Assassin’s Creed 3 is very much a true successor to the series and quickly became my favorite Assassin’s Creed next to AC2. Set during the era of the American Revolution, the player can explore colonial Boston, New York, and The Frontier, a large stretch of wilderness. Instead of the traditional building climbing, the Frontier replaces them with trees. Movement through trees felt natural, but didn’t feel quite as satisfying as scaling architecture. Even though the game still includes architecture with the inclusion of Boston and New York, running on rooftops and scaling buildings weren’t as fun, as say, a place like Venice or Florence. Instead, I found myself running through the streets often. It didn’t help that the rooftop guards seemed especially on alert compared to previous games. That being said, it was amazing to get to walk the streets of a long lost version of Boston and New York. Another location to explore is the Homestead, your base of operation much like Monteriggioni in AC2. Among the many, many side missions to tackle, a series of them revolve around building your Homestead. These were my favorite side missions in the game and one of the most involved. Throughout the game you will find people skilled at a particular trade that you can recruit to live on the Homestead. Unlocking these new craftsman allow you create new upgrades and items to trade for more money. What I liked most about these missions was the ongoing story that unfolds as you progress through the game. Your recruits aren’t just items to acquire; they each have their own story and relationship with Conner and other members of the community. I wish some of the other side missions were as fleshed out as the Homestead missions. Some of them, like the Hunting missions, I mostly ignored. 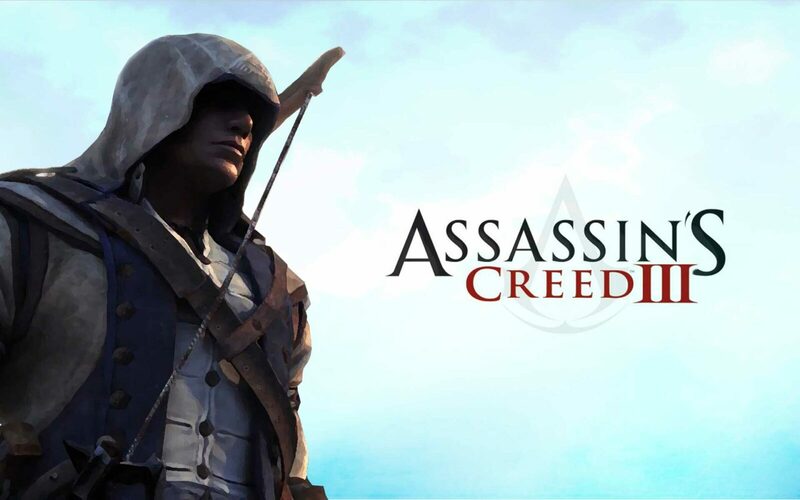 With Ezio’s story concluded, Desmond now takes control of a new assassin, Connor Kenway, his half – Mohawk/ half – British ancestor. Whether it was a development decision or poor voice acting, Connor felt much blander compared to Ezio. His back story was interesting, but Connor’s delivery of lines was, at times, painful. He did improve towards the end of the game, so it wasn’t all bad. Connor’s heritage plays a direct role in gameplay. When exploring the American frontier, you can hunt animals with traps, bows, or tomahawks, and after killing your prey, you can collect an assortment of parts to later be used to craft new items for trade. It’s a great thematic concept, but the hunting soon became tiresome. Eventually I ignored it entirely. Setting AC3 in the American Revolution was a brilliant decision. It was a complete thrill to experience many of America’s most famous moments, first-hand (even if the events weren’t entirely accurate). You will participate in the Boston Tea Party, ride with Paul Revere, fight in the Battle of Bunker Hill, and interact with American icons like George Washington, Benjamin Franklin, and Samuel Adams. I felt much more involved in this setting than the Italian Renaissance from Ezio’s trilogy, likely because I can relate more to events in my own country. A major addition to the game is naval combat. Naval combat is spectacular and fun to play. There’s a fair amount of strategy involved in combat when factoring wind direction, sails, and boat position relative to enemy fire. It really makes you feel like a naval commander of old. With such an ambitious addition to gameplay, some games tend to underutilize them, but there are plenty of naval missions to meet satisfaction. There are some negatives to the game. For one, it’s by far the buggiest game of the series. I regularly encountered numerous audio bugs from out of synch lip movement to odd music placement. There was one major bug that happened that wiped the picture off my screen. Luckily it wasn’t game breaking; it was solved by a game restart. This is only a small sample. There were many more bugs I encountered. Although I liked the homestead missions, I did not like traversing through the homestead. It was big and also not the smoothest area to travel quickly, feeling more like a chore than anything. One of my biggest problems was the pacing of the story during the last couple sequences. There was an obvious sense that the game was being rushed, and seemed like the developers ran of time. This leads to my next complaint: the game dropped the ball with Haytham Kenway. Trying to avoid spoilers, Haytham was the best character in the game, and should have been the major focus for Connor. Instead, by the end of the game he was regulated to a secondary character. Considering he was a playable character at the beginning of the game, the route the game took with him at the end did not make sense in relation to the rest of the game. Haytham Kenway was the perfect main antagonist because his relationship with Conner could have been more dynamic than what we got. Many people were upset over the ending to AC3. Avoiding spoilers, I agree it could have been handled better, but it did not bother me very much. It was not nearly as bad as the Mass Effect 3 debacle, and anything else is small time compared to that. I could write a separate review on the multiplayer in Assassin’s Creed 3. I’ve been playing it since it’s inception in Brotherhood and it’s one of my favorite multiplayers in video games. The concept is simple: You are given a target to assassinate. Find you target, and kill him. The problem is you must find him/her in a crowd of NPC characters. While you’re hunting your target, another person is assigned to kill you. It becomes a cat and mouse game while trying to be as inconspicuous as possible. The quieter and more planned out your kill is, the more points you will receive. Running around a map and killing targets will not reward you many points, instead you are rewarded for patience and style. Some may find it boring, but there’s nothing more rewarding than setting up a complex kill and finally catching your opponent totally off guard. There are multiple modes you can play, but Deathmatch, Wanted, Assassinate, and Manhunt (basically what I describe above) are the best. Completing challenges and leveling-up unlock special story elements unique to multiplayer. Unlocking these segments and texts, makes you want to keep playing. One problem I have is the matchmaking system is garbage. Too many times I was in a lobby with several people, only to be transferred to another with 0 people. I also really hate automatic room assignments. Why can’t we see every game available, and why can’t we selectively join them? 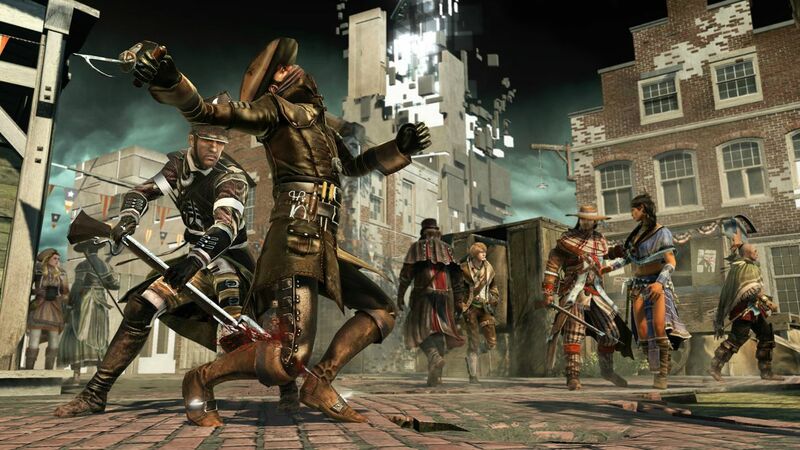 A new mode introduced in AC3 is Wolfpack. It allows you to work together with 3 other people to kill an NPC target within a time limit. Getting past a level adds more time on the clock. Coordinating your attacks, focusing on quality kills, rewards you with more points, allowing you to complete levels faster. It’s very hard to find a match where the players play it correctly. Most people try to run and kill their targets as fast as possible without focusing on high point kills, which is counter productive. Most of my experience with this mode has been highly frustrating. You can play this mode by yourself which is highly useful for unlocking challenges that are extremely hard to unlock against expert human opponents. Fantastic graphics. Naval combat looks stunning, while the Frontier is filled with scenic views. Many audio bugs that make the game feel less polished. Voice acting is superb for the most part, aside from Connor. The music isn’t as great at Assassin’s Creed 2, but there are certainly a few amazing tracks that are every bit as good as AC2. I enjoyed Assassin’s Creed 3 way more than I ever thought. There are a lot of bugs, but most of them were a mere annoyance than anything. The game whimpered out in the end, but I felt the game was strong through the majority. If you love history, particularly American history, you will likely love playing through this game. Multiplayer did not feel like a tacked on multiplayer like so many other games either. It could have been sold as a separate game in itself. 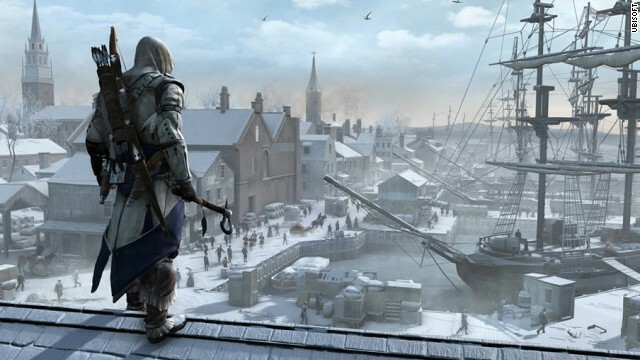 Now that the price is dropping, AC3 is worth a look, and will provide a bang for your buck. I enjoyed Assassin’s Creed 3 way more than I ever thought. There are a lot of bugs, but most of them were a mere annoyance than anything. The game whimpered out in the end, but I felt the game was strong through the majority. If you love history, particularly American history, you will likely love playing through this game.